The world’s standards for real wealth and prestige seem to be changing day by day. Currently, for one to be considered as one of the wealthiest, they would probably have to own a yacht. Yachts come in different shapes and sizes, but none beats the Shaddai. 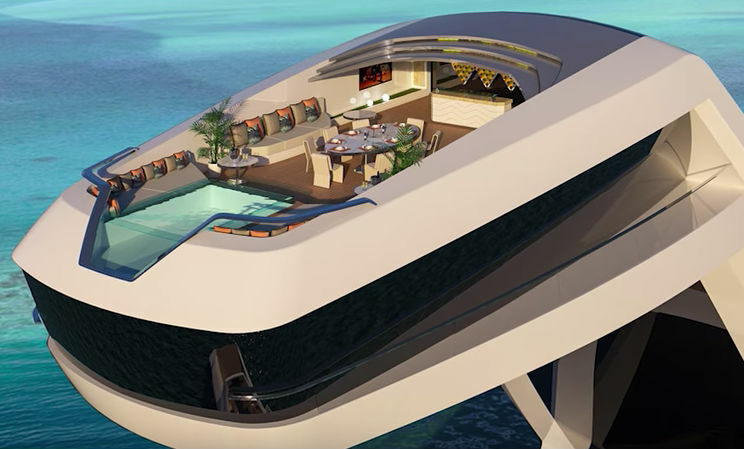 Envisioned by Italian yacht designer Gabrielle Teruzzi, this yacht will be the epitome of luxury and will cost not less than a whopping two hundred and fifty million dollars. Whoever gets himself the Shaddai will have a whole floating paradise to himself. When translated loosely to Hebrew, Shaddai means ‘almighty.’ This is the perfect name for the yacht; it is the world’s tallest as well as the most modern. It has been referred to as the superyacht or the mega yacht. The Shaddai is four hundred and ninety-two feet long and one hundred and twenty-five feet high with a beach club of three thousand square feet. The most incredible feature of the Shaddai is the owner’s cabin. It is raised one hundred and twenty-five feet away from the rest of the yacht, giving him a complete sense of privacy as well as a feeling of power. The cabin has its infinity pool, and the overall effect is that of reaching the sky and being on top of the world as described by the designer. Here he can watch the sunset and look down below to the rest of the yacht which gives him the feeling of being dominant, which is the concept behind Teruzzi’s design. There is enough space for the owner’s longing, dining and swimming needs. The beach club and the main aft. deck are united by an infinity pool with a glass floor. The swimmers will be able to see the ocean and have a feeling of never-ending waters which will be made more real by the sound of water falling from the infinity pool above to the one below. The main deck is also designed to be a place where the owner (and other users) can enjoy a complete sense of peace of mind as well as a breathtaking view. There will be luxury furniture including sunbeds and floating couches. 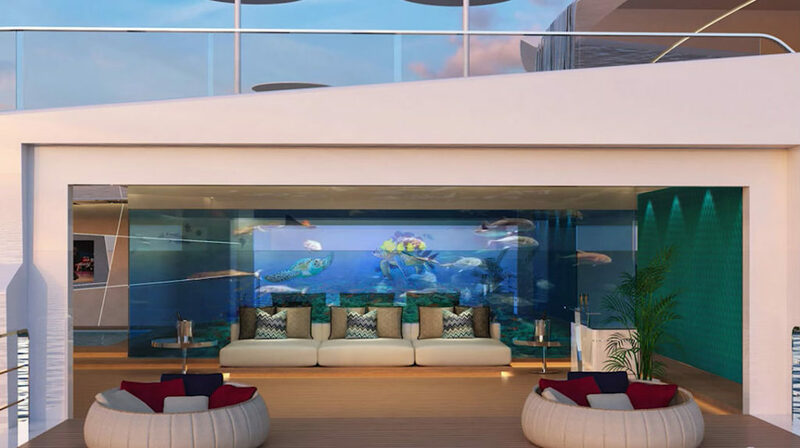 Teruzzi points out that the aquarium in the middle of the room serves two different purposes; dividing while also unifying the two sides of the yacht. The materials, color combinations and interior designs have been carefully selected from some of the most prominent fashion houses in Italy. The color teal is particularly used to show elegance. The yacht also has plenty of space which is designed carefully for the visual appeal. The Shaddai is perfect for the world’s tycoons and billionaires. The lavish features all point towards power and an elevated sense of class, which is the basic concept behind its design. It would also be useful when throwing parties and hosting other events; the beach club and main deck are principally designed for this purpose. The Shaddai has taken the world’s standards of luxury and wealth to a whole new level. The yacht may still be a concept, but with so much publicity, one can be sure that the world’s billionaires can’t wait to get their hands on it. Who wouldn’t want to float around the world’s seas in such a yacht?